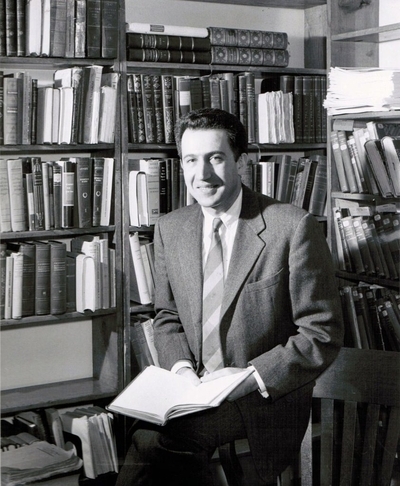 Richard Pipes in his study in Cambridge, Mass., in 1959. He spent his entire academic career at Harvard. 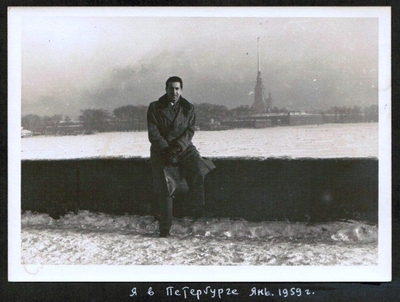 Professor Pipes, who spent his entire academic career at Harvard, took his place in the front rank of Russian historians with the publication of "Russia Under the Old Regime" in 1974. But he achieved much wider renown as a public intellectual deeply skeptical about the American policy of détente with the Soviet Union. In 1976, he led a group of military and foreign-policy experts, known as Team B, in an ultimately pessimistic analysis of the Soviet Union's military strategy and foreign policy and the threats they posed to the United States. The group's report, commissioned by the Central Intelligence Agency as a counterweight to an analysis that had been generated by the C.I.A. 's own experts — Team A — helped galvanize conservative opposition to arms-control talks and accommodation with the Soviet Union. And it set the stage for Ronald Reagan's policy of challenging Soviet foreign policy and seeking to undermine its hold over Eastern Europe. While writing ambitious histories of the Russian Revolution and the Bolshevik regime, Professor Pipes continued his campaign for a tougher foreign policy toward the Soviet Union in the late 1970s as a member of the neoconservative Committee on the Present Danger and as director of Eastern European and Soviet affairs for President Reagan's National Security Council. 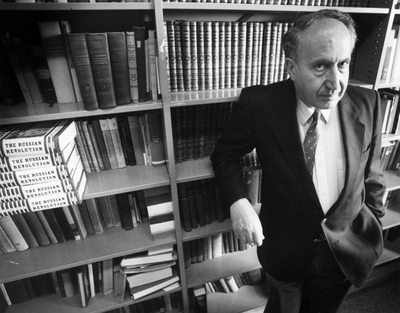 Despite this public role, he regarded himself, first and foremost, as a historian of Russian history, politics and culture — a field in which he performed with great distinction. A forceful, stylish writer with a sweeping view of history, Professor Pipes covered nearly 600 years of the Russian past in "Russia Under the Old Regime," abandoning chronology and treating his subject by themes, such as the peasantry, the church, the machinery of state and the intelligentsia. One of his most original contributions was to locate many of Russia's woes in its failure to evolve beyond its status as a patrimonial state, a term he borrowed from the German sociologist Max Weber to characterize Russian absolutism, in which the czar not only ruled but also owned his domain and its inhabitants, nullifying the concepts of private property and individual freedom. With "The Russian Revolution" (1990), Professor Pipes mounted a frontal assault on many of the premises and long-held convictions of mainstream Western specialists on the Bolshevik seizure of power. That book, which began with the simple Russian epigraph "To the victims," took a prosecutorial stance toward the Bolsheviks and their leader, Vladimir Lenin, who still commanded a certain respect and sympathy among Western historians. "I felt and feel to this day that I have been spared not to waste my life on self-indulgence and self-aggrandizement but to spread a moral message by showing, using examples from history, how evil ideas lead to evil consequences," Professor Pipes wrote in a memoir. "Since scholars have written enough on the Holocaust, I thought it my mission to demonstrate this truth using the example of communism." The British historian Ronald Hingley wrote of "The Russian Revolution" in The New York Times Book Review that "no single volume known to me even begins to cater so adequately to those who want to work through 842 intellectually challenging pages in order to discover what really happened to Russia in and around 1917." William G. Rosenberg, writing in The Nation, praised Professor Pipes's "remarkable intellectual range, crystalline style and capacity to muster an extraordinary mass of evidential detail" but complained of "scholarship distorted by passion." "Russia Under the Bolshevik Regime," which was published in 1994 and covered the period from the Russian Civil War to the death of Lenin in 1924, also met with a divided response. By this time, he had long been prominent as a leading critic of détente and arms-control talks with the Soviet Union, and a loathed figure on the left. "Those who called me a cold warrior apparently expected me to cringe," he wrote in "Vixi: Memoirs of a Non-Belonger" (2003). "In fact, I accepted the title proudly." Mr. Pipes joined the recently formed Committee on the Present Danger in 1977. (The group had borrowed its name from a similar, though unrelated, group that had sought to counter Soviet expansion in the immediate postwar years.) The committee was composed of neoconservatives who opposed nuclear-arms talks — "hollow rituals," as Professor Pipes called them — and supported increased spending on weapons programs. Perhaps his most public role in challenging American policies toward the Soviet Union came in 1976 under President Gerald R. Ford. At the time, conservative critics had for several years been attacking the C.I.A. 's National Intelligence Estimate, an annual assessment of the Soviet threat, calling it overly optimistic about Soviet foreign-policy intentions and blind to what they believed to be a dangerous military buildup. In response, the C.I.A., under pressure from the president's Foreign Policy Advisory Board, conducted an in-house review of its performance in analyzing Soviet strategic doctrine and military capabilities over the previous decade. Professor Pipes, right, with Vice President George H.W. 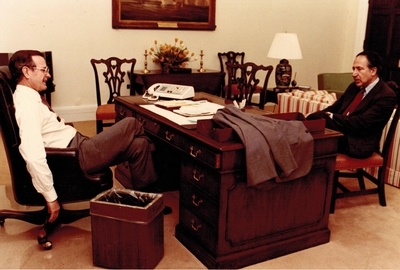 Bush in the White House in 1982. But the resulting report by the C.I.A. 's experts — the so-called Team A — was found to be so deficient that President Ford asked the C.I.A. director, George H. W. Bush, to order a competitive analysis, pitting the agency experts against a team of outsiders. Professor Pipes, who had been serving as an adviser to Senator Henry M. Jackson of Washington, a Democrat who was a harsh critic of détente, was appointed to lead Team B. Its conclusion — that the C.I.A. had badly underestimated the "intensity, scope and implicit threat" of Soviet military objectives — later gave ammunition to Ronald Reagan as he took to the campaign trail for the 1980 presidential election espousing a hard line against Moscow. With Reagan's victory over President Jimmy Carter in the election, Professor Pipes, taking a leave from Harvard, was appointed director of Eastern European and Soviet affairs at the National Security Council. He again became a lightning rod for the left, which regarded him as a sinister influence on Soviet policy. He went on to play a pivotal role in drafting National Security Decision Directive 75, which set forth the Reagan administration's policy toward the Soviet Union. It called for the government to shift the emphasis away from punishing Soviet misbehavior after the fact and to concentrate instead on pursuing policies that would change the nature of the regime. But by Professor Pipes's own account, the State Department, headed by Alexander M. Haig, shut the N.S.C. out of most important decisions, and Professor Pipes's relative inexperience in Washington infighting was seen to have blunted his effectiveness. He left the post after two years, the maximum number Harvard allowed. Ryszard Edgar Pipes was born on July 11, 1923, in Cieszyn, Poland, where his father, Marek, ran a chocolate factory. 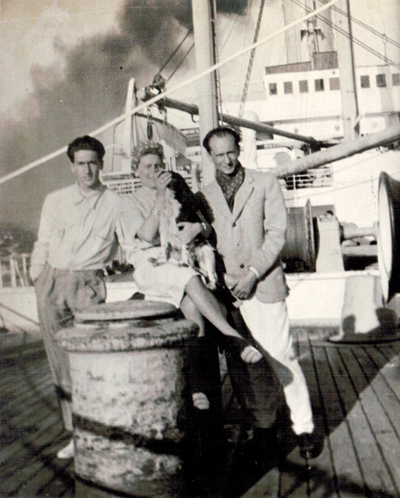 His mother, Sara Sofia (Haskelberg) Pipes, who went by Zosia, was a homemaker. The family, which later moved to Krakow and Warsaw, spoke German at home and Polish on the street. In 1939, soon after German troops entered Warsaw, the Pipeses fled to Italy on forged passports. They reached the United States a year later, settling in Elmira, N.Y.
To further his education, Professor Pipes set about compiling a random list of 100 American colleges from the advertising pages of "Who's Who," then sent off postcards to them asking for financial aid and part-time work. Muskingum College in Ohio (now Muskingum University) replied with offers for both. In 1942, in his junior year, he was drafted into the Army Air Corps and sent to study Russian at Cornell, where he met his future wife, Irene Roth, who survives him. Besides her and his son Daniel, he is survived by another son, Steven, and four grandchildren. He had homes in Cambridge and in Harrisville, N.H.
After receiving a bachelor's degree from Cornell in 1946, he earned a doctorate in history at Harvard in 1950. His dissertation, on Bolshevik nationality theory, became the basis of his first book, "The Formation of the Soviet Union: Communism and Nationalism, 1917-1923" (1954). He later wrote a two-volume biography of the liberal politician Peter Struve, "Struve: Liberal on the Left, 1870-1905" (1970) and "Struve: Liberal on the Right, 1905-1944" (1980), as well as two books on Soviet-American relations, "U.S.-Soviet Relations in the Era of Détente" (1981) and "Survival Is Not Enough: Soviet Realities and America's Future" (1984). "The Russian Revolution was made neither by the forces of nature nor by anonymous masses but by identifiable men pursuing their own advantages. Although it has spontaneous aspects, in the main it was the result of deliberate action. As such it is very properly subject to value judgment." In the writing of history, he went on, "fundamental philosophical and moral questions can never end." "For the dispute is not only over what has happened in the past," he wrote, "but also over what may happen in the future."